The classic food of India is extensively acknowledged for its use of herbs and spices. Indian food is known for its variety of dishes. The way of cooking food varies from region to region. It also varies seasonally depending on which fruits and vegetables are ripe. The predominant food of India includes wheat, rice and pulses. Many Indian dishes are cooked in vegetable oil. India is famous for its major variety of food easily available in large number of restaurants and hotels. Indian food is mainly influenced by religious and cultural choices and traditions. Delhi : Delhi is the capital city of India. Delhi is largely known for its street food. Delhi has a different type of food traditions as Delhi has people from different parts of India. 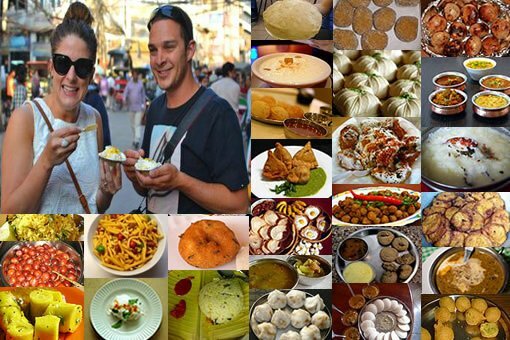 Some famous street food of Delhi are Chole- Bhature, Kachori, Chaat, Paratha, Biryani and Desserts. Rajasthan : The Rajasthani food is cooked with variety of ingredients. Food is generally cooked with milk and ghee. Rajasthani people basically takes oily food. You will get mouthwatering dishes in Rajasthan. Due to the paucity of vegetables gram flour is mainly used in Rajasthan. Major dishes of Rajasthan includes Daal-Baati-Choorma, Raabdi, Panchkuta, Ker- Sangri, Laapsi, Kadhi and Boondi. Snacks famous in Rajasthan are Bikaneri Bhujia, Mirchi Bada, Pyaj Kachori, Daal Kachori. Dal Baati is most preferred and served dish in Rajasthan. It is served with Choorma. Jaipur : Jaipur is the capital city of Rajasthan also known as Pinkcity Jaipur. Jaipur is known as Foodie’s paradise. A trip to Jaipur is not completed without eating Dal- Baati- Choorma, Kachori. The food is usually spicy and oily. Some famous sweets of Jaipur are Ghewar, Jalebi, Kalakand, Balushahi. If you are on a visit to Jaipur, you must try Lassi. Jaipur Lassi is famous in India.